The thistle continues to sprout purple but no seeds yet for the birds. The bees and grasshoppers seem to like it though. Temps in the mid 80's, VERY humid, light wind and partly cloudy to start. Temps around 98, less humid, light winds and sunny on return. The humidity was a killer today! I was drenched in sweat within 20 minutes of hiking and this is on slightly inclined terrain. As I continued to hike, the humidity eased some and the wind picked up a little so it was do-able. Saw some mountain bikers and a trail runner today which was pretty unusual. Not much animal activity except for two rats scampering into the weeds as I approached. 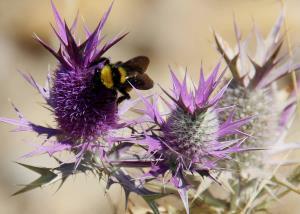 The thistle is growing (photo attached) and being used by grasshoppers and bees. Vegetation is drying out even more so the park's predominant color is golden brown except for the broom weed which continues to stay green. It was a hot and dry hike but a nice one. Water and shade available at Bell's Point - about .75 miles south from 5 Points Junction on Playground trail. Water, shade, info kiosk and dry toilets available at Burkett Park - at the junction of the southern end of Burkett Trail and northern end of Winding Snake Trail.